Jeff has been practicing Vipassana meditation since 1996. 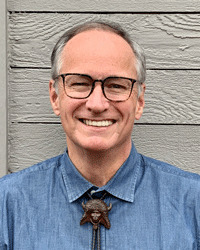 He is currently in the Spirit Rock Teacher Training Program, and is a graduate of both the Spirit Rock Dedicated Practitioners Program and Community Dharma Leaders Program. In the Community Dharma Leaders Program, he started identifying as a POC, and began attending POC retreats. Jeff moved from San Francisco to Oklahoma in 2001, and started a weekly sitting group in 2003.